The most generic economic matrices for development - GDP and income per capita, 2011-15 forecasts by IMF, btw. Note that the income per capita measure here is not the most often quoted and understandable (US dollars per capita) but is expressed as a form of national production per capita after accounting for purchasing power parity (PPP). While the calculation of this measure has some weaknesses it gives an idea of the relative wealth scales across countries. 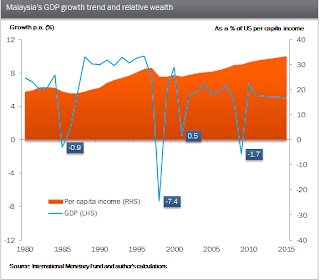 Thus the graph tells us that the standard of living of an average Malaysian is 80% less than the average American in 1980; and 69% less in 2010 and by IMF estimations, 66% by 2015. Of the 4 recessions in the past 30 years, only one has been sourced domestically (1998's Asian Financial Crisis).